With the weather set to improve any day now and real summer conditions soon to arrive many are turning their attention to the garden. On a hot summer’s day there is nothing quite like sitting out in the garden with beautiful surroundings enjoying the sunny weather. Creating the ideal conditions for relaxation in the garden can take a lot of effort but the end result is well worthwhile. Once created, with minimal maintenance this environment can be enjoyed year after year. The first consideration when creating a relaxation area within the garden is choosing a suitable surface as a base for the area. 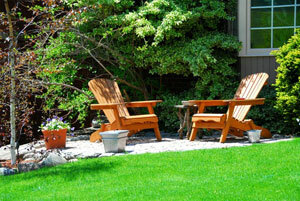 The most common options are decking or paving. Some may choose gravel as a third option as this is a low cost alternative but it is not so kind on bare feet. Decking is particularly aesthetically pleasing but will require regular treatment in order to preserve the wood. Paving can be attractive if a good quality material is selected. For example, slate paving is much more appealing than concrete paving slabs. The choice of material will ultimately come down to personal preference, available money and the expertise of the homeowner. The homeowner should next consider the seating for the relaxation area. Depending on the intended purpose of the area the homeowner may choose a table and chairs set or sun loungers or even a combination of the two. Outdoor seating tends to be available in wood or PVC plastic. While PVC plastic is inexpensive compared to wooden furniture and requires substantially less maintenance, it is nowhere near as attractive as wood. Conversely, wooden furniture will require regular treatment to protect it against decay and should ideally be stored indoors when not in use. For many an outdoor relaxation area would not be complete without the addition of a barbecue. 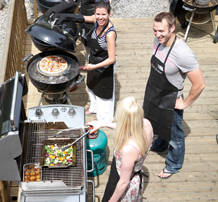 Barbecues not only serve a practical purpose but also create a wonderful atmosphere in the garden. Depending upon how often the barbecue is likely to be used the homeowner may choose a compact barbecue or a larger fixed barbecue. Moreover, the choice also must be made between gas and charcoal as the fuel for the barbecue. Each fuel has pros and cons. Charcoal creates an atmospheric aroma which is often absorbed into the food for a truly unique flavour, however charcoal barbecues require substantial preparation and are difficult to regulate. 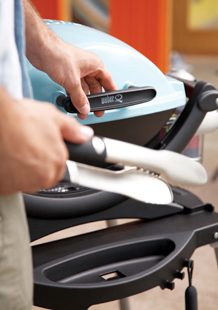 Conversely, gas barbecues can be used instantly without any preparation and the temperature can be finely adjusted. However, gas barbecues do not create the same flavours and smells as their charcoal counterparts. Whichever type of barbecue you decide to go for, there is a huge range available at www.weberbbq.co.uk. Once the basics of the outdoor relaxation area have been taken care of the homeowner can turn his attention to the finer details. Additional fixtures and fittings may be installed including railings, trellises, water features and planters. All of these features combined can create a little paradise in the garden which can be enjoyed extensively throughout the summer months and can provide hours of quality relaxation for all of the family. Summer is a great time to sit back relax and read a novel. The pictures in this blog post shows the setting to sit back relax and read a novel. I’d love to get my garden looking like this. Thanks for the great blog post. Excellent looking garden and one that is worth trying to replicate or at least copy some parts of it that may be relevant to my own.